By turns exhilarating and exasperating, Subtle's music is creative, eclectic, and occasionally brilliant. As titles such as Ornette Coleman's "Shape of Jazz to Come" or the Refused's "Shape of Punk to Come" prove, artists throughout musical history have endeavored to earn distinction as purveyors of "the sound of the future". One of the latest, and most worthy, contenders for this title is the hip-hop/experimental rock outfit Subtle. On its second album, For Hero: For Fool, the Oakland-based group presents a futuristic musical vision that is vivid, unsettling, and, above all, distinctive. Subtle is a group of six musicians, who, in addition to standard rock instruments like guitar, bass, and drums, play keyboard, cello, woodwinds. At first, the band's title does not seem to describe its music very well. On the surface, the music is bold, and, much like the album's cover, a striking collage. From the very first track, electronic beats, ethereal keyboards, repeating strings, sung melodies, and furious hip-hop vocals jostle each other, begging for listeners' attention. This obvious eclecticism is, however, only one facet of the band's sound. The group is indeed appropriately named: its members maneuver between sounds, dynamics and styles with great dexterity, subtly manipulating musical nuances to lead listeners down unexpected musical paths. Ironically, the most original music often has a strong tendency to invite critical clichés. Such is the case with Subtle. Without a doubt, the band's music defies description. Although no written account adequately captures the experience of listening to Subtle, newcomers to the band's music will be well served by a listening guide. The album's first highlight is the opening pair of tracks, "A Tale of Apes I and II". The first of these is a hip-hop-driven song that features a dense layer of acoustic and electronic samples, while the second is more reserved and ethereal. Other highlights include the album's danceable first single, "The Mercury Craze", and "Return of the Vein", which is notable for the interplay between the rap flow and the energetic string part in the middle of the song. Perhaps the most succinct description of Subtle's style is "restless experimentation". In the case of For Hero: For Fool, the word "restless" has a double meaning. First, it refers to the band's eager creativity. Second, and more unfortunately, it refers to the way listeners are likely to feel after listening to the album. Subtle is consistently creative and sometimes brilliant. The group's sonic barrage, however, can become overwhelming. The constantly changing dynamics, styles, and time signatures are almost disorienting at times, especially as the album develops. Although the band probably intended to produce an uneasy atmosphere, Subtle's approach doesn't quite work on all of the tracks. The songs are consistently fascinating but only intermittently satisfying. Other flaws in the album are minor. The tracks contain a good mix of instrumentals, sung melodies, and hip-hop vocals, but the style of emcee Adam "doseone" Drucker, sometimes lacks, ironically enough, subtlety. The most skilled rappers are able to coax musical surprises from their lines, highlighting poetic nuances such as assonance and internal rhyme. By comparison, doseone's style occasionally sounds monotonous. Another problematic aspect of the album is its lyrical content. The band writes poetic cerebral, lyrics which tackle social issues metaphorically, but amidst all the adventurous music, the words seem somehow inconsequential. Small problems aside, For Hero: For Fool is a worthwhile album. 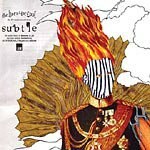 Subtle was obviously trying to create a unique listening experience on their latest record, and they have succeeded. Critics toss around adjectives like "futuristic" too frequently, but that word really seems to fit For Hero: For Fool. The album contains a hip blend of experimental rock and underground hip-hop that is comparable to little, if any, music in existence today. A healthy contingent of music listeners could be compared to daredevils in their unending search for new experiences and unexpected thrills. Subtle makes music that caters to such listeners, and anyone belonging to this target group should find much to enjoy on the band's latest release.